The Beer Crusade: IIPA: Holy Grain! Picture of the IIPA going into the fermenter, an 11 Lt batch. The Day went smoothly, which I dont think is too hard for a Partial mash brew. 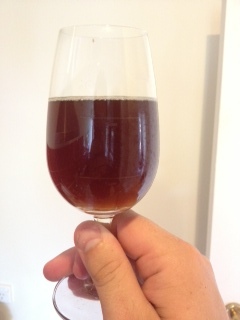 It was 1.073 going into ther fermenter, with a Predicted 1.016-1.018 to finish. It's going to sit in ther fermenter to 10 days before dryhop #1 which is 15g Zythos, 10g centennial and 10g Cascade, followed 5 days later by 8g cascade 15g centennial, 10g zythos and I've at the last minute thrown 10g citra in this part as well. Hopefully that'll ad some extra zing into it. i might even make this a 7 day dry hop, #1 is 5 days followed by a 5-7 day dryhops#2. Its a little too dark, came out quite a copper colour, which I believe is the Amber LME doing that. Mashed nice and low at 65 deg C. Plenty of hops Thrown into the Boil, totalling 118 IBU based on Brew Pal for Iphone. i tried using Pantyhose as hop bags to keep the trub out of the brew, I still got a good amount, as I ran out of pantyhose... so I had to throw them straight into the kettle. Recipe is as follows: 0.7kg Pale malt 0.25kg Melanoiden 0.125kg Pale Crystal 0.2kg Carapils Late additions at 15mins Amber LME-1.5kg & 0.3kg Dextrose. Hops were Columbus for Bittering, and Centennial, Zythos and cascade in the boild and dryhop. adding citra in there in the second dry hop too. I'll let you decide on the schedule, 75 Min Boil. first addition at 60. 10 days fermentation, followed by 5 day dryhop #1 & 5-7 Day Dryhop #2 righto, see you next time, and don't forget if you have any questions, feel free to ask any questions etc.